The White House has announced a new sub-committee of the National Science and Technology Council to help balance online economic opportunities with consumers' rights to privacy. The Subcommittee on Privacy and Internet Policy will also help to synchronise the practices of federal agencies with policy being considered and developed by lawmakers. The sub-committee is to be chaired by Cameron Kerry, general counsel at the Department of Commerce, and Christopher Schroeder, assistant attorney general at the Department of Justice. Despite growing concerns about privacy on the internet, the US has yet to develop a comprehensive policy to cover consumer privacy. 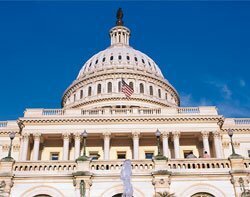 The sub-committee will work to develop a common internet privacy strategy among all of the legislative and regulatory stakeholders in the US and abroad, said Kerry and Schroeder in a blog post. "In this digital age, a thriving and dynamic economy requires internet policies that promote innovation domestically and globally while ensuring strong and sensible protections of individuals' private information and the ability of governments to meet their obligations to protect public safety," they said. Core principles of the sub-committee in include: facilitating transparency, promoting co-operation, empowering people to make informed and intelligent choices, strengthening multi-stakeholder governance models, and building trust in online environments.